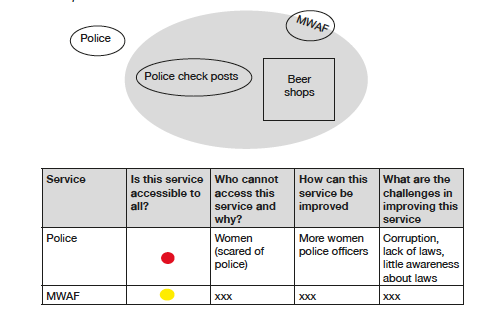 To explore the levels of trust in public services in a community. For all the issues identified previously in the process, ask participants to use Chapatti / Venn diagrams to map trust in public services. Draw a big circle and write one issue in the centre. Place public services linked to the issue and those that the community trust inside the circle, mark public services with no trust on the outside; services that the community somewhat trusts can be placed on the circumference of the circle. Repeat step 1 to 3 for each issue (i.e. undertake a trust mapping for each issue). For each public service identified complete the matrix below using the traffic light tool.